Batwoman #3 A new issue of simply the best-drawn super-hero comic being published today. Demon Knights #3 Think of this as a medieval Justice League, or just as an excellent dark-fantasy book. Official summary for the new issue: "Under siege and under fire—quite literally—the hastily assembled Demon Knights find that the villagers they're trying to protect are ready to turn on them... and that they're locked behind embattled walls with a demon whose very touch can kill! And if the only human Etrigan gives half a damn about dies of her wounds, then Hell help anyone around him…"
Fantastic Four by John Byrne Omnibus Vol. 1 So. Uh. This book costs $125. I've been planning to buy it for a while, because I loved Byrne's Man of Steel and I hear his FF was in the same league. Official summary: "It was the world's greatest comic magazine—again! Not since the days of Stan Lee and Jack Kirby had a creator so perfectly captured the intense mood, cosmic style and classic sense of adventure of Marvel's First Family. Fresh off an earth-shattering and reputation-making run as penciler on X-Men, John Byrne proved his writing talent was every bit the equal of his art as he pulled double-duty on Fantastic Four, launching Reed, Sue, Ben and Johnny into realms of imagination and wonder into which few creators before had dared to travel. From the four corners of the globe to the farthest reaches of space to the deepest depths of the Negative Zone, the FF face off against foes old and new - including the Dr. Doom, Galactus and Annihilus! Plus: The FF aid the Inhumans, bid farewell to the Baxter Building, don new costumes and celebrate their 20th anniversary in style as Byrne reminds us all there's a family at the heart of this team of adventurers! Collecting MARVEL TEAM-UP (1972) #61-62; MARVEL TWO-IN-ONE #50; FANTASTIC FOUR (1961) #215-218, #220-221, #232-262 and ANNUAL #17; PETER PARKER, THE SPECTACULAR SPIDER-MAN (1976) #42; AVENGERS (1963) #233; THING (1983) #2; and ALPHA FLIGHT (1983) #4." Point One #1 Marvel's Fear Itself crossover this past summer was a mess. They're moving on to their next event with Point One. Official summary: "IT ALL BEGINS HERE! 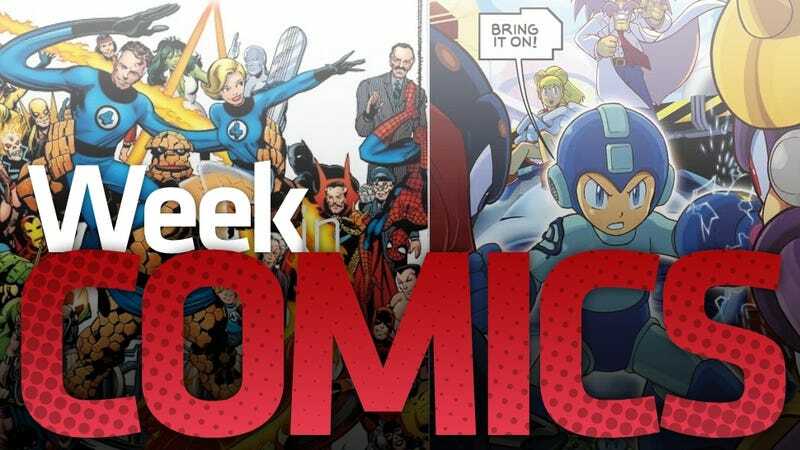 Here are SEVEN all-new stories that set the stage for everything coming your way in 2012 from the biggest names in the comics industry. You CANNOT miss this! Catch a tease of the biggest change to the Marvel Universe in over 35 years!" Spy Vs. Spy Omnibus Did you ever read Mad Magazine? Did you like the Spy vs. Spy strip? Was it possible to not like it? This is a $50, 368-page collection of, according to the publisher, "their original exploits." DC Universe Online Legends Vol. 1 (collection) Official summary: "Based on the hit DC Universe Online game from Sony! As this epic adventure begins, Lex Luthor's obsession with destroying Superman reaches fever pitch when he cuts the ultimate Devil's deal with Brainiac - but with the shake of a hand, has Luthor consigned humanity to extinction? Collecting issues #0-7!" Mega Man #7 Official summary: "Mega Man's search for his kidnapped sister and clues to clear Dr. Light's name is coming up with nothing. And Dr. Wily is still at large! Maybe he can save the day with the help of the six Robot Masters! Or are the robots wandering right into Dr. Wily's latest trap?" Lots of day-and-date comics from Marvel, DC and Image are on the ComiXology app, plus they're always adding interesting back catalogue comics, including the remainder of Jonathan Hickman's Fantastic Four run and the short-lived Doc Savage comic from DC's recently-shuttered First Wave pulp line (I'd heard mixed things about that book; can anyone vouch for it?). The Dark Horse app always adds a heap of comics, too. This week, they've added a batch of new Star Wars comics and six issues of an Evan Narcisse favorite, Usagi Yojimbo. And the best comic I Evan Narcisse read last week…. Evan writes: "Just about everyone knows Superman's origin. After all the cartoons, movies and TV shows, any retelling of how Kal-El came to Earth shouldn't be riveting but that's exactly what Action Comics #3. The best comic I read last week was written by Grant Morrison with art by Gene Ha and Rags Morales. "Morrison's script takes you to incredible highs as Clark Kent stands up to the bullying of Metropolis' crooked power structure and resonant lows when Superman realizes that the people he's trying to help don't look at him as a hero. This issue's best scene involves the rescue of a cat and how what you expect to happen doesn't. "I've always been a fan of Ha's slick, lushly illustrative style and he's a perfect choice for the Krypton flashbacks, which makes Superman's homeworld look like no other version I've seen before. Brash, self-righteous and more than a little headstrong, Morrison's New 52 Superman feels like just the kind of vision to make people fall in love with the character all over again." That's it for this week. Next week, I'll be back with new comics recommendations for everyone else.